They started this one with a bang. The story picks up right where we left off, smack in the middle of a fight between Duke and the Robins, against a bunch of creeper sewer warriors. And the banter between the Robin team is great. It’s so fun and witty, and has the whole teenager feel about it, without being annoying or feeling too rehearsed. Those first six pages are an awesome ride. Tons of action and every panel delivers. The whole scene is one you won’t forget quickly, and you get lost in the chaos of it all. One of the best parts about finally seeing the Robins in action, is equally awesome in both art and writing. The unique signatures of each uniform is great, and they speak to the differences of each character. There’s an attitude about each funky belt buckle, a story behind every hood. The little quirks of each costume are so much fun, and set each character apart. 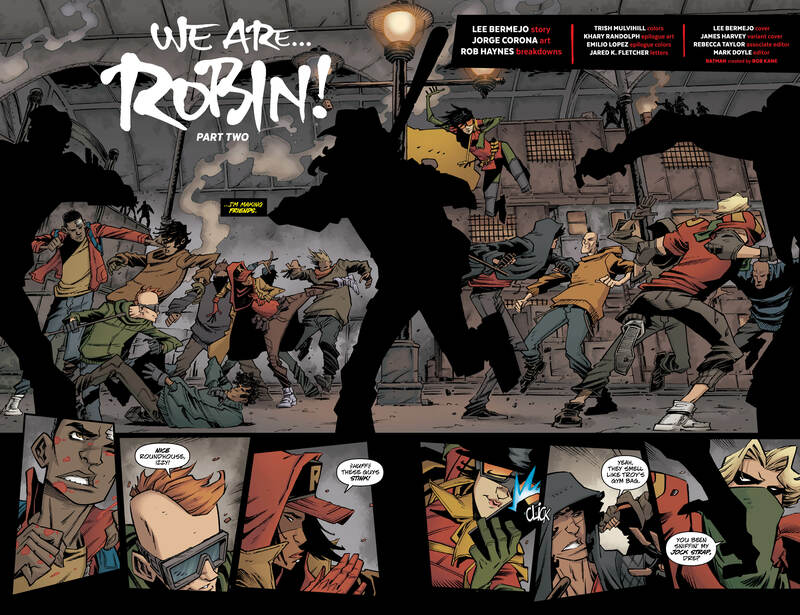 The attitude of the Robins comes in the dialogue. They feel like kids you want to know. Like you want to play video games with them on a Saturday night, but you would totally go fight bad guys with them too. They take shots at each other, laugh about funny stuff, drop pop culture references, all of that good stuff, and it makes them feel real and concrete. In this issue we also got a glimpse of the man who might be behind this whole operation, which helped open up a lot of interesting questions about what’s really going on. Who is this guy? Why are Duke’s parents so important? Can he be trusted? I mean, we didn’t really get any answers, but it’s important that the questions were put out there. It solidified that fact that there’s something bigger going on here. And I for one, want to find out exactly what that is. These guys are laying groundwork, and I’m looking forward to see what comes up.